Dr. Gwendolyn Midlo Hall, a renown professor (Rutgers University) and author of several books regarding the African American and Slave Histories, partnered with the Center for the Public Domain, and ibiblio.org. Utilizing the various strengths of each other, a website called "Afro-Louisiana History and Genealogy" was developed to assist those searching for their roots. The website contains extracted information regarding more than 100,000 slaves that were brought to the United States during the 18th and 19th centuries. Access to this wonderful extracted database is free. Unfortunately there are no images of the documents provided at this site, however each entry generally provides the source of the extracted information including the location, date, document number, and reel number. "In 1984, a professor at Rutgers University stumbled upon a trove of historic data in a courthouse in Pointe Coupee Parish, Louisiana. Over the next 15 years, Dr. Gwendolyn Midlo Hall, a noted New Orleans writer and historian, painstakingly uncovered the background of 100,000 slaves who were brought to Louisiana in the 18th and 19th centuries making fortunes for their owners. Poring through documents from all over Louisiana, as well as archives in France, Spain and Texas, Dr. Hall designed and created a database into which she recorded and calculated the information she obtained from these documents about African slave names, genders, ages, occupations, illnesses, family relationships, ethnicity, places of origin, prices paid by slave owners, and slaves' testimony and emancipations. In March 2000, the Louisiana State University Press published published Dr. Hall's databases on a CD-ROM. Dr. Hall's work in creating the Afro-Louisiana History and Genealogy is far reaching. There are many who have a stake in being able to freely access this data, from historians, genealogists, anthropologists, geneticists and linguists , to Americans seeking keys to their past. Dr. Hall shares with others an interest in seeing that her research and databases reach the broadest possible audience. 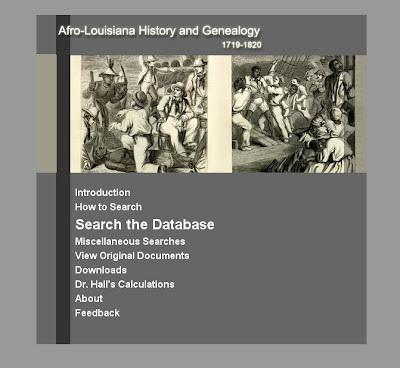 Together, Dr. Hall, the Center for the Public Domain, and ibiblio.org bring you the Afro-Louisiana History and Genealogy 1699 - 1820 Database, a user-friendly, searchable, online database that is freely accessible to the public." This website will prove to be invaluable for those searching their African roots. If you are interested in researching on this site, please click here and will be taken directly to the websites search engine. I would suggest that you first read the "How-to-Search" section at the site to learn how to make the search engine more productive. I would also suggest that you consider reading the Acknowledgments section of this site which can be found here. This section of the site provides you with information about the extraction process that was performed and information about the database itself. Have fun searching this site.